The postal regulator has called for Royal Mail to be partly privatised to safeguard the quality of the UK's mail delivery service. 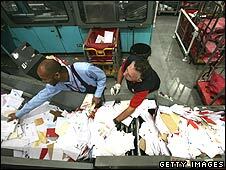 Postcomm warned that Royal Mail's financial difficulties would worsen unless bold action was taken. Nigel Stapleton, Postcomm's chairman, told the BBC that without private sector involvement, Royal Mail may require a government subsidy. Private sector partnerships had worked in other European countries, it said. Postcomm is making the proposal to an independent review on the future of postal services that has been set up by the government. "Postcomm wants to see the government and Royal Mail embrace a partnership approach with the private sector to secure a universal service," Mr Stapleton said. Royal Mail's 350-year monopoly ended at the start of 2006, when other licensed operators were given the right to collect and deliver mail. However, it is still obliged to deliver letters to and from anywhere in the UK at a uniform tariff. It made a loss of £279m in the year to the end of March. The core problem for Royal Mail is that it has lost business in the lucrative bulk mail collection and sorting market, but still must uphold less profitable universal delivery. The proposal will be highly contentious and could lead to Royal Mail being partly owned by a private equity firm, according to BBC business editor Robert Peston. The government would find it hard to dismiss Postcomm's suggestion out of hand - although the prime minister was likely to be irked that such a divisive issue was being forced back on to his agenda, our business editor says. A spokesman for the Department for Business, Enterprise and Regulatory Reform said the review was independent of the government. "It is not for the department to comment on points made in submissions to the panel at this stage, or second-guess the panel's views," he said. The Communication Workers Union, the main postal workers' union, said Postcomm's proposal overstepped its remit. "If this was endorsed by the government it would be a political football," a spokesperson said. Postcomm said more competition was needed to ensure that a high-quality service was maintained. 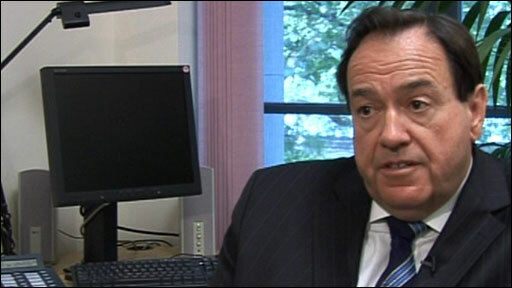 To encourage new operators, it urged that Royal Mail's exemption from VAT should be scrapped. "Royal Mail needs access to private capital and a stronger set of incentives to enable it to restructure and become more profitable," Postcomm said. It also proposed that Post Offices Ltd, which controls the post office network, should be separated from Royal Mail and kept wholly in public ownership. It already receives a substantial subsidy and is viewed as a de facto social service. Earlier this month, the independent review of the postal sector found in an initial report that liberalisation had produced "no significant benefits" for either households or small businesses. The independent panel warned that the "substantial threat" to the Royal Mail's financial security threatened the universal service. While the report said homes and small firms had not gained from the increased competition, it said large companies had "seen clear benefits from liberalisation - choice, lower prices and more assurance about the quality of the mail service". It will submit its final report this summer.